Sometimes, when I’m early to work, I just wait in the car for a while. Now and then I practice drawing. In today’s world of glass windows and reflective storefronts, we don’t always notice reflections. They become invisible unless we make ourselves aware of them. I only captured a few of them in my sketch above. 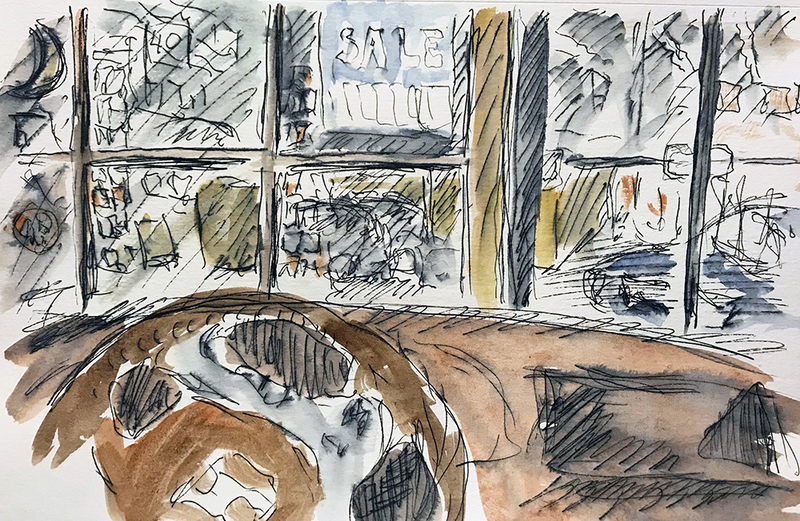 This entry was posted in Personal Stories and tagged art, drawing, parking, pen and ink, reflections, sketching, visual arts, waiting, watercolor, windows. Bookmark the permalink. This is great. I am really loving these sketches you are doing recently. And you are right about reflections. We filter them out, but if you look into them, it is like finding another world right in front of you, with different rules and layers.